The issue isn’t if you have ego, it’s how much. You need enough ego to believe you can make a difference, but not so much that you believe you can do it on your own. Self-centered – egotistical leaders – live in a shrinking universe. They’re confused about themselves and can’t appreciate others. Ego relies on authority and force rather than influence to lead. Others are self-centered, but you aren’t. Every conversation is a competition. You make excuses for using people. Their weaknesses are a catastrophe; yours are minor inconveniences. An apology hasn’t passed your lips since you were caught with your hand in the cookie jar. Self-centeredness pollutes every aspect of servant leadership. #1. Say things that hurt but help. Self-centered leaders avoid tough issues because it makes them uncomfortable. Ego waits for anger to say tough things. Be kind and address awkward issues at the same time. #2. Help others clarify and pursue their aspirations. Humility serves others. Ego serves itself. #3. Invite others to speak. When are you most energized? Tip: Invite teammates to speak for themselves in meetings. Don’t speak for them. #4. Say, “Thank you,” everywhere you go. One-way accountability is from superior to inferior. Be as accountable to others as you expect them to be to you. How might leaders have enough ego to make a difference? 1. Pointing out areas for people to improve in is critical and it must be done privately and in a positive way as you stated. Some of the most “difficult” people who ever worked with me, who I did this with, have kept up our relationship for decades because they appreciated the honest and direct input. 2. Servant leadership is the key. Often in large firms, the staff groups take on too much power and control and forget that it is the business that provides all of us with our career and our pay. 3. Thank you calls to your team and adversaries, especially in a crisis situation, can help a lot! Thanks Brad. I love how you explain and illustrate dealing with difficult topics/people. It’s so true, we respect those who care enough to speak truth into our lives. We learn through humility, but still can grab the bull by the horns and get the job done too, just not in an “egotistical state”. Strong Ego’s alters life’s journey in my eyes, these individuals like the plateau above without serving! They rule with iron fists and stomp their feet! The choices we make as servants truly energize greater then a deflated ego. Thanks Tim. Love the iron fist/stomping feet picture. It captures one aspect of egotistical leadership. It made me smile. I’m glad you mentioned energy. It’s the thing that is often left out of leadership conversations. I think it’s central to success. 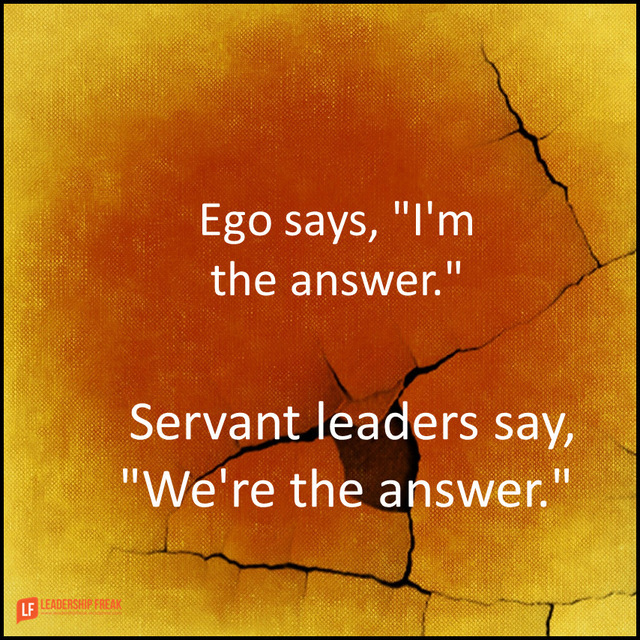 Quoting from your post: “Ego relies on authority and force rather than influence to lead.” Ego blinds the manager (not only not a servant leader, not even a leader) to her/his shortcomings but also to the team members’ strengths! Thanks John. You really nailed an important idea. “Ego blinds.” I’m going to remember that one for sure. Especially in organizations with strong accountability cultures, nothing makes two-way accountability harder than the overriding ego of the leader. It is a major stumbling block to otherwise effective people and organizations. Ego breeds resentment when double standards of accountability exist, and thereby trust is lost. Thanks for another insightful post! Thanks Jim. You really brought out the idea of mutual accountability. The idea of resentment and lost trust because of double standards has real punch. Thanks for sharing your insights. Hi Dan, I appreciate your pointing out the upside of ego. There’s a lot of ego-bashing these days (which is well-deserved). But it’s important to also remember that a healthy ego allows us to function in the world. Understanding what that looks like is crucial to success as a leader. Thanks Jesse, It’s great seeing you here today. My encounters with you help me see what healthy ego looks like. Best for the journey. Working with a team can be difficult for them. A good leader need some human qualities and we are not all equals with this. My all time favorite (not) experience in this regard was a past manager (as stated above, not a leader) who had a really bad habit of saying, “As Ken can tell you…” and then proceed to say whatever he wanted the listener(s) to hear. This happened several times, and always caught me off guard. Yeah, stage 3 leaders say: ‘I’m great’ and the unspoken part is… ‘and you’re not’. I don’t think the point is being made in the context of what you think it is. Most of the points are evidently questions that are and can be asked in a meeting or any public platform. My understanding of point 4 is that, one should not be afraid to even have a 1 on 1 conversation with those who know. Mainly to gain knowledge that you might not have in preparation for a public engagement in future. I don’t think the main point being made here now suggests that we should and can always be blank when we go into public or collaborative spaces for discourse just because we can ask for clarity. Such action will simply be laziness or exploiting the concept itself and not making own effort even in private to know more.